A meat thermometer takes the guess-work out of your grill and roast cooking. While there are many other tricks for figuring out the doneness of foods, a thermometer makes it easy. There are several different models and types of thermometers available, from simple ones to fancy digital ones with alarms. 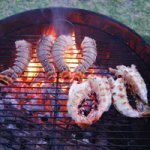 Most can be used for all types of cooking, from oven cooking to grill and barbecue cooking to fireplace cooking. Be sure to check the temperature tolerance of yours before you use it in any setting. What is a Meat Thermometer? A meat thermometer is basically a sharp skewer which you poke into the middle of a cooking piece of meat to read the internal temperature. It allows you to know the internal doneness of your meat without having to cut it open to look. This takes the guess-work out of your cooking, especially for cuts of meat that are critical to be done "just right" like chicken breasts, pork loin, a thick steak, etc. If you cook them just a bit too long, they may get dried out and tough. If they are undercooked (especially poultry and pork) they can be dangerous to eat. 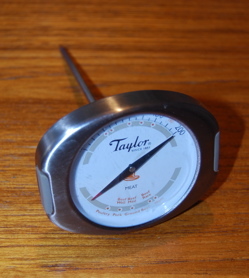 A meat thermometer helps you determine the perfect time to pull your food out of the oven or off your grill. Standard Dial Thermometer - These thermometers are basically like your mercury thermometer you use to take your temperature when sick, except with a sharp metal point and a dial which shows the meat temperature. These are easy to use and virtually indestructible. 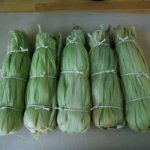 Many of them are heat-proof, so you can place them at the start of cooking and just leave them in place (make sure yours is oven safe first so you don't melt it!). Digital Meat Thermometer - These vary from simple small thermometers which have a digital readout to larger, fancy thermometers with timers, alarms and wireless technology. Rather than an analog dial, your temperature shows up on a digital screen. Obviously, these require batteries and while most are not heat-proof so you cannot leave them inside the oven some have heat-proof wires that can be left inside the oven or grill during cooking. For grilling or fireplace cooking, some of these are even incorporated into a long grilling fork utensil as pictured above. This allows you to test the doneness of your meat without burning your knuckles and the hair off your arms! Wireless Meat Thermometer - These generally have a thermometer needle that is placed in the meat with a wire coming out of your oven or grill which is connected to a digital transmitter. You keep the wireless receiver with you and can see your temperature change in real time as you sit and enjoy a beverage in your living room or sitting in your patio chair! This makes cooking much easier as you don't have to keep getting up and down to check the meat. 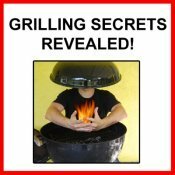 Also, if you are constantly opening your grill to check the temperature, you are loosing heat in your grill, slowing down the cooking process. Some of these even have alarms which can be set to go off once your meat reaches the desired temperature. Pop-up Types - You may have seen these on whole chickens or turkeys for roasting. They are generally a plastic or metal plug that is stuck into the breast. When the internal temperature reaches the desired point, it pops out so that you can see quickly that your roast is done. These are not versatile in that they don't tell you the temperature, they just pop up when done. Also, they are less accurate and not re-usable. Read the temperature on the thermometer - You should wait at least 30 seconds to see what the temperature is. It usually stops going up after about 30 seconds but this can vary from thermometer to thermometer. Remove your food when it reaches close to your desired internal temperature - If your recipe indicates a goal internal temperature use that. If not, there are several tables available of appropriate temperatures for different types of meat. Some thermometers even have them listed on the thermometer itself. Special note: When cooking larger roasts, you should remove your roast from the oven just before it reaches your desired temperature, maybe 5 to 10 degrees below. If you let the meat rest on a warm platter, covered in aluminum foil (which helps the temperature and juices redistribute) for 5 to 30 minutes (more for larger roasts, less for smaller cuts like a steak) the internal temperature will continue to rise several degrees as it sits. Therefore, if you take out a steak that is medium-rare, by the time it has sat for 5 to 10 minutes, it may be medium! Here is a general guide for temperatures for doneness for various meats. With meats that can carry disease (like poultry and pork), ere on the side of higher temperatures, especially if you have any doubt to the quality and freshness of the meat. Well: Please don't cook your meat well done! 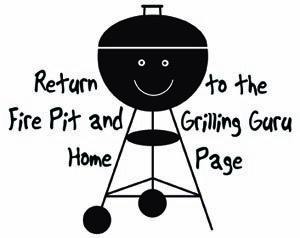 Done with the Meat Thermometer page? Go back to the Grill Accessories page.